Retained Needles in Laparoscopic Surgery. Open Or Observe? Currently, there is no standard of care on how to manage a retained needle or small foreign body during laparoscopic surgery. There are several reports of complications associated with retained surgical foreign bodies; however the true risk of a retained small foreign body is not known. A 20 question survey assessing approach towards retained needles was electronically sent to attending surgeons, surgical residents, and risk management professionals. Through a case presentation, respondents are asked how they would manage a patient with a retained needle during an elective laparoscopic case. From 10/2009-2/2010 we received 358 responses; 103 respondents did not complete the survey and were excluded. 255 respondents include 143 practicing surgeons (56.1%), 107 residents (42%), 4 risk management professionals (1.6%), and one medical student (0.4%). 47.6% of the attendings had been in practice 15 or more years. When faced with a patient with a retained intraperitoneal needle, 116 (45.8%) would convert to open, 67 (26.5%) would leave the needle intraperitoneally, and 70 (27.7%) would seek the patient’s or family’s wishes; 2 declined to answer. When the option of seeking patient or family wishes was eliminated, 54.5% would convert to open, while 45.5% would leave the needle intraperitoneally. Although 236 respondents (92.6%) felt that a retained needle puts the patient at some degree of future risk, 228 (89.4%) felt escalating the search to laparotomy was of higher risk than the foreign body itself. The majority of residents and surgeons in practice 0-5 years would open (68.2%, 59.3% respectively); the majority of surgeons in practice 10-15 or 15+ years would leave the needle (69.6%, 59.2% respectively). Although 89.8% of respondents felt surgeons are obligated to disclose the presence of a retained object, 83.1% (212) rarely or never discuss the possibility of a retained needle pre-operatively when obtaining consent for surgery. In a free response question on whether respondents had any experience with patients with retained foreign bodies, 21 attending surgeons shared reports of patients with no adverse effects, and two reported complications (bowel obstruction, object migration into bowel). In a separate free response question on whether respondents had any experience with foreign objects causing harm, 16 attending surgeons reported adverse effects, including infectious complications (nine), pain (four), delayed hemorrhage (one), and small bowel obstruction (one). No current best practice exists regarding approach to retained needles or small objects of uncertain injury potential in laparoscopic surgery. 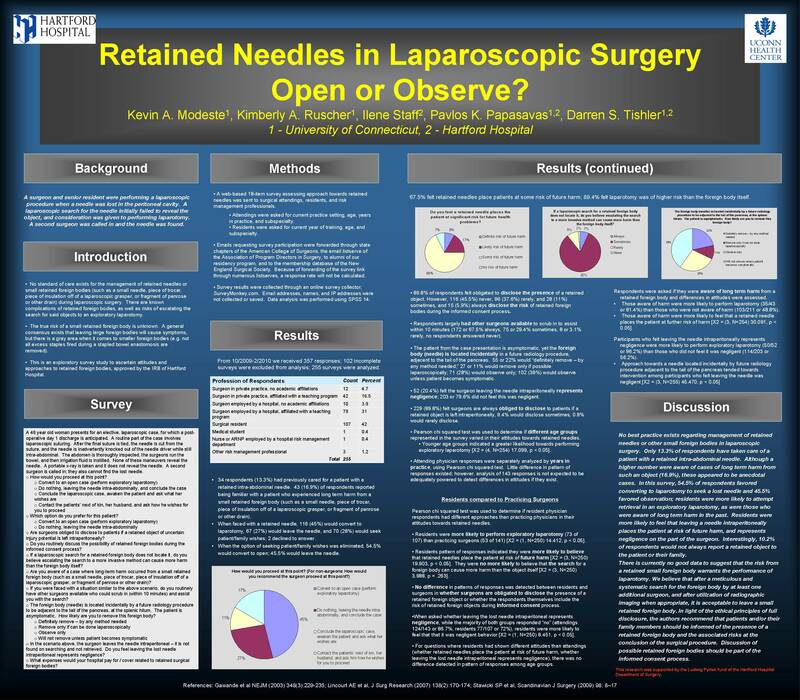 In this nationwide survey, 54.5% of respondents favored converting to a laparotomy to seek a lost needle and 45.5% favored observation with more residents favoring a surgical approach. 10.2% of respondents do not feel obliged to disclose the presence of a retained object. Cases were reported documenting both no adverse effects and adverse effects of retained foreign objects.